I've finished my eye cream - remember this post? I think it was about 3 weeks ago when I chucked it out. Question! What am I using now? If you're familiar with this brand, you'll know that they are best known for removing stretch marks. This product totally took me by surprise. I was just at Priceline doing my usual routine (browsing the aisles on my lunch break) when I spotted this together with other Palmer's skin care products. I was sooo intrigued because it was new released at that time and they were having some promo. I actually love the packaging because i don't have to stick my finger in i, you jsut need to squeeze the product out. 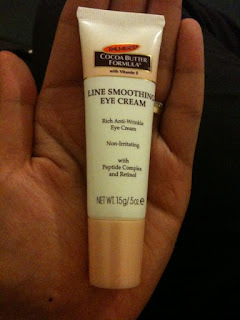 My last eye cream was a pump and I LOVED it due to the same reason - very hygienic. Even though it's thick, it sinks in the skin quickly. Very affordable. I think it's only $12.95 but that was the promo price so I am not sure how much it is. I don't think it will be uberly priced. After 3 weeks of using it day and night, i can say that it's improved my under eye area. I dont have crows feet just yet so I can't comment on that. Yes unless i find something else that I'd like to try. This product really surprised me. I wouldn't even think twice of buying if it wasn't for the promo and the sign "New Release" :) So i am glad I bought it. Hey Sheryl! How's the eye cream? Is it recommendable? Mine is finishing soon, so am scouting around for other good products.